The law and the court system can have a major impact on the public administration of local and state economic development programs. However, just because the court decides local government can use their powers for economic development purposes the end result does not always land where the Court intended. Eminent domain is used for a wide variety of “public purposes,” ranging from public utility services to public housing to roads and infrastructure. The U.S. Supreme Court took its first big constitutional step in expanding the government’s power, beyond transferring private property into a public facility or transportation system, when it established eminent domain could be used to condemn blighted property as part of a “slum clearance” project. 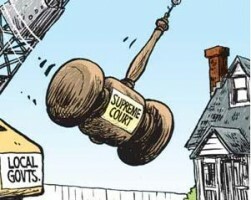 In Berman v. Parker, the Supreme Court held it was a valid public purpose to use eminent domain to take blighted property and transfer its ownership to another private party, due to the decaying nature of the property in question, to use that property for housing. Next, the Supreme Court determined it was a valid use of eminent domain to break up a land oligopoly in Hawaii in Hawaii Housing Authority v. Midkiff. In Kelo v. New London, the Supreme Court approved eminent domain for a non-blighted neighborhood and determined that economic development was enough of a public purpose to justify the taking of private property and transferring that property to another private land owner. The U.S. Supreme Court set off a fire storm when it decided that economic development is a valid public purpose. In Kelo, the City of New London, Connecticut, once an economic success because of a nearby U.S. Navy submarine base, used eminent domain to seize the land of several property owners solely for the purpose of giving the land to a private developer to bring economic development to the site. The development in question involved 1,000 jobs in the research and development field. Following a long string of precedents from other public purposes areas, the U.S. Supreme Court held that economic development was in fact a valid public purpose for eminent domain purposes and the citizens in this case could have their property taken. However, the Court took the unusual step of permitting state court’s to determine if this decision applied to states. Reaction to Kelo was swift and negative. Courts, legislatures and even he public spoke against Kelo. While Kelo was a major victory for local government’s efforts to implement economic development, it has proven to be a classic case of winning the battle but losing the war. States have taken a wide ranging approach to the use of eminent domain for economic development purposes after Kelo. Some states offer no legislative restrictions on the use of eminent domain while others offer nominal or moderate legislative limitations and many states provide major restrictions on the use of eminent domain for economic development purposes. In fact, 42 states have adopted eminent domain legislation and ballot measures in response to Kelo. These reactions fall into five categories: no economic development; clarifying “public use;” permitting use in blighted areas; requiring greater public involvement; and addressing compensation issues. The majority of states acting in response to Kelo prohibited the use of eminent domain for economic development purposes. This typically included prohibitions against eminent domain for purely tax revenue purposes or the transfer of someone property to another private entity. Alabama passed legislation prohibiting the use of eminent domain for retail, commercial, residential or apartment development, for generating tax revenue, or for the transfer of private property to another private party, but contains a blight exception. California’s voters approved an initiative prohibiting the use of eminent domain to acquire an owner-occupied residence to convey it to a private entity. Idaho prohibits the use of eminent domain for economic development and defines economic development as the transfer of private property to another private entity for economic, tax revenue, or employment growth or promoting the general economic health of the community. Nebraska prohibits the use of eminent domain for economic development purposes, which is defined to mean use by a commercial entity or to increase tax revenue, the tax base, employment or general economic conditions. In addition, Pennsylvania permits the use of eminent domain in economic development only where the private enterprise occupies an incidental area within a public project. Author: David J. Robinson, Principal of The Montrose Group, LLC.